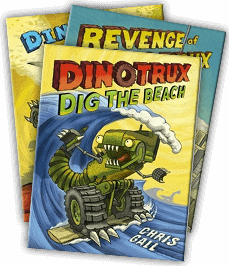 Surf’s up in the third picture book about the Dinotrux! Fed up with steamy summertime Jurassic jungles, the mighty monsters are getting hot and grumpy, and they need a vacation…. Time to roll on down to the beach! Tyrannosaurus Trux might be able to “hang ten” on his surfboard, but not all of the trux feel so at home near the water. Can they organize their skills to dig up the beach and build the best sandcastle ever? Dive into the silliest, splashiest Dinotrux adventure yet to find out!